Born in Sushchany, Kiev pr. (Ukraine), 1885. Studied at Kiev Art College 1902-10 (some interruption of study); I.I.Mashkov's studio-school, Moscow 1906; MOSCOW COLLEGE OF PAINTING, SCULPTURE AND ARCHITECTURE 1906-07; Imperial ACADEMY OF ARTS 1910-16. Active in Kiev, Ukraine. Member of AKhChU 1926-29(31?). Important shows include "Twenty Years of the Workers' and Peasant's Red Army", Moscow, 1938; "All-Union Art Exhibition", Moscow, 1946; "All-Union Art Exhibition", Moscow, 1947. Taught at Kiev Art School 1926-33; Kiev Art Institute 1930s-50s. Died c. 1980. 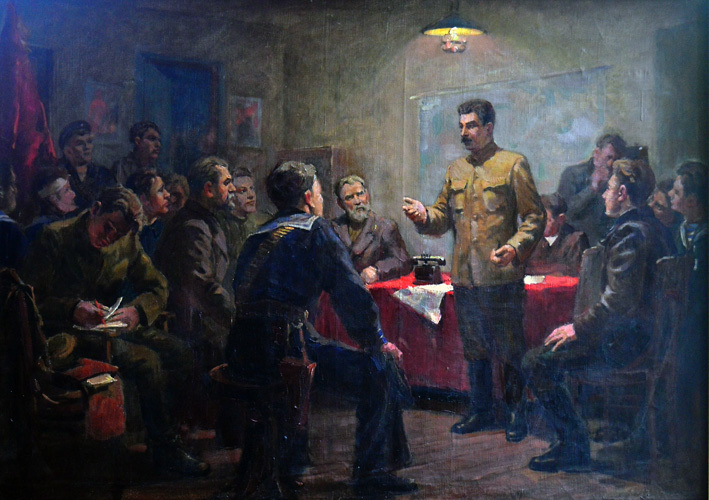 "Stalin as an Organizer of the October Revolution", oil on canvas, 85 x 117 cm. "J.Stalin and S.Kirow visiting the Wolkow-Gidrostation" and "Revolution", both oil on cardboard, 32 x 22 cm.